After the negotiations in Ankara between Gazprom’s chairman of the board, Alexei Miller, and Turkey’s minister of energy and natural resources, Taner Yildiz, the head of Gazprom stated, «We have agreed to schedule the work so that we get to the signing stage of the Intergovernmental Agreement on the pipeline during the second quarter of this year, and the first gas shipment will be pumped into Turkey in December 2016... The first leg of the pipeline will have a capacity of 15.75 billion cubic meters, which we will direct entirely at the Turkish market. Given the readiness of the Russkaya compressor station and of the majority of the offshore pipeline route - this is a totally realistic deadline». According to Mr. Miller, «the joint creation of gas-transportation facilities within the framework of this important project makes Gazprom and Botas strategic infrastructure partners... Everyone is focused on results. Our top priorities are to analyze the existing route options within Turkey and to determine the point of emergence from the sea, the point where the gas will be delivered to the consumers in Turkey, and the point where the gas will cross the Turkish-Greek border». The total capacity of the planned gas pipeline, which has been unofficially dubbed the «Turkish Stream,» will be 63 billion cubic meters of gas per year, supplied via four legs. The pipeline will travel for 660 kilometers along the route planned for South Stream, and for another 250 kilometers along a new corridor toward the European part of Turkey. Azerbaijan was interested in the news of the Russian-Turkish agreement. Azerbaijani observers immediately commented that the agreement between Moscow and Ankara dealt a blow to the Trans-Anatolian Natural Gas Pipeline (TANAP), for which the EU and the US are lobbying. The website Haqqin.az notes, «In any event, barring anything unforeseen, today Russia has outplayed all the parties involved in the Azerbaijani gas project, including the European Union. While Azerbaijani gas is being shipped to Turkey, the Turkish market will also receive about 35 billion cubic meters of Russian gas from under the Black Sea. And at that point, Turkey is unlikely to need the several billion cubic meters of Azerbaijani gas that must be sent to the Turks in keeping with existing commitments. 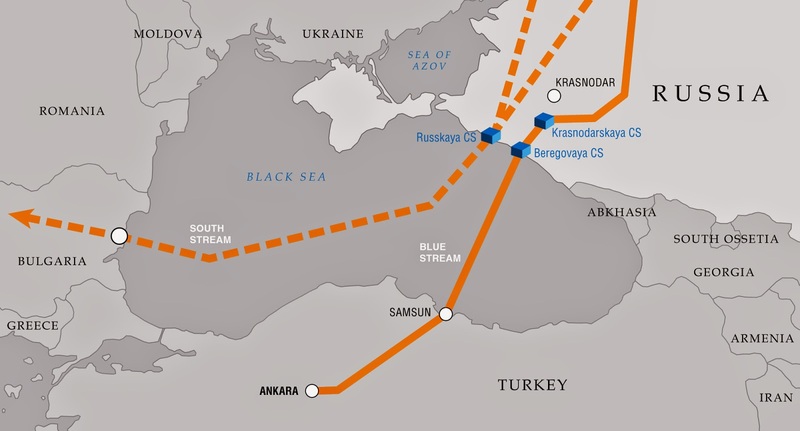 And if Gazprom manages to build a hub on the Turkish-Greek border just as quickly, then Russian gas will enter Europe ahead of the Azerbaijani gas. And the first supplier always has the best chance». Western capitals also reacted sharply to the unfolding Russian-Turkish gas agreement. After the West derailed the rollout of Russia’s South Stream pipeline, the US Department of Energy began to insist that Russian gas projects be seen as primarily political schemes rather than economic. With baffling logic, European Commissioner Maroš Šefčovič called Russia’s decision to «supply the full amount of gas through Turkey instead of Ukraine» a blow to Gazprom’s image as a reliable supplier. Quickly, it seems, the Europeans forgot any problems they had had with Russian gas supplies that stemmed from Ukraine’s unreliability as a transit country. The West is primarily concerned that redirecting Russian gas to skirt Ukraine will devalue their «Ukrainian card,» which the Western capitals so eagerly play against Russia. In this respect, the West considers both the former South Stream as well as the current «Turkish Stream» equally undesirable. Either of those pipelines would eliminate Ukraine from the geopolitical games being played in accordance with Western scripts. Experts, however, see the problem from a different angle. The US business news agency Bloomberg, citing a report from researchers at the Oxford Institute for Energy Studies, noted specifically that «the cancellation of South Stream is part of a broader change of strategy for Gazprom that plays to the company’s strengths». And the inexplicable entanglements of the Opal pipeline, an extension of Nord Stream, can help explain exactly who in the gas field is being driven primarily by political rather than economic motives. «For three years, this gas pipeline, which has helped make gas transit less risky for Germany, the Czech Republic, and to a certain extent Austria and Slovakia, should operate at 50% capacity, just because there is Russian gas, but there’s essentially nothing else…» claims the chairman of the board of directors of Gazprom, Viktor Zubkov . The European Union does not want to incur additional financial expenses by buying gas from Turkey, but those could have been avoided if Europe had not shot down the South Stream project. At that time the Russians were prepared to finance the construction, but the EU will have to use its own funds to put in the pipelines running from the Turkish border. The year 2019, when Russian gas will bypass Ukraine and go through Turkey, will be here soon. Somewhere that is well understood. In particular, in Hungary. The prime minister of that country, Viktor Orban, stated that anti-Russian sanctions «were in conflict with Hungary’s interests,» and that he intends, in his words, «to come to terms with Russia on a gas agreement» during a meeting with Russian President Vladimir Putin in Budapest. Putin arrives in the Hungarian capital on February 17th.